County Cork is one of the traditional counties of Ireland. It is located within the province of Munster, and was named after the city of Cork. The southernmost of the Irish counties, it is also the largest, covering an area of just under 7,500 square kilometres. Cork is nicknamed "The Rebel County", as a result of the support of the townsmen of Cork in 1491 for Perkin Warbeck, a pretender to the throne of England during the Wars of the Roses. In more recent times, the name has referred to the prominent role Cork played in the Irish War of Independence (1919-1921) and its position as an anti-treaty stronghold during the Irish Civil War (1922-23). Cork city is the second largest city in the Republic of Ireland and the island of Ireland's third most populous city. It is the principal city and administrative centre of County Cork and the largest city in the province of Munster. Simply the best address in Youghal. Opposite the promenade and lighthouse where everyone else strolls to take in the views and take photos. You can enjoy the view throughout your stay. A short stroll into town or to the beach, you dont need to use your car. 3 Clifton is one of just 6 Victiorian townhouses that were built to the highest standards over 130 years ago. After years of renovation and restoration we are now able to offer this fabulous luxury townhouse. 3 Clifton is a listed property in a heritage area. Read the reviews and most of the guests rave about the views from the front windows, particulary from the window seat on the main lounge. They are right, the views are spectacular - taking in the Atlantic ocean to the South, the hills and mountains of county Waterford to the East, the river Blackwater to the North and the beautiful river estuary right in front. Sleeps 9. Why not stay in our Irish labourer’s cottage in County Cork? Where: a small village called Gortroe, near Youghal (about 30 minutes drive East of Cork City) What has it got? A lovely lounge/kitchen with pine floor and pine vaulted ceiling, a solid fuel burning cast-iron stove (starter pack of fuel provided), hand-made Irish Dresser and kitchen cupboards. Cooking facilities (electric stove with oven, microwave etc. ), refrigerator and dishwasher. A main bedroom with double bed. A second bedroom with adult size bunk beds (can be reduced to one bed if required), chest of drawers and an open fire. Shower/toilet room accessed via 3rd spare room/bedroom which contains hand-made large wardrobe. An acre of land at the back with a small orchard. Oil central heating. There is a sitting area at the side of the cottage with an outdoor table and space for a tent. Within a short walk are a village shop, wine bar/restaurant and a hotel with swimming pool. Sleeps 4. Charming old world cottage, perched overlooking Ballycotton Bay, in Ballycotton Village, Co. Cork. Electricity and Oil may be paid with booking or by metre on departure from cottage. The village of Ballycotton stands high above the neat little harbour from which fishermen have gone out for centuries to the rich fishing grounds of Ballycotton Bay. This neat little cottage is situated on Chapel Road, which overlooks the bay. The harbour is packed with trawlers and pleasure craft. Anglers can enjoy themselves with rod and line from the end of the quay or hire boats for sea fishing trips. Around the village are spectacular cliff top walks 200feet above the sea. Long strips of beautiful sandy beaches are just 10 minutes walk from the cottage. Sleep 4. 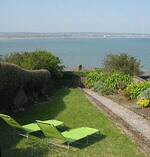 Situated on Whitepoint Strand, this beautiful house is a five minute walk from Cobh town and train station. With large gardens and enjoying stunning views of the water, The Moorings can accommodate up to seven people (usually five) and is presented in excellent decorative order. This large house is an ideal base for a short-term let or a family holiday, There are several top-class golf courses within easy access including Fota Golf Club and Cork Golf Club in Little Island. A kiddies' playground is situated a stone's throw away and Fota Safari Park and golf course are nearby. The blue-flag Garryvoe beach, Ballymaloe house and Trabolgan Holiday village can be visited by car. A stony strand is located across the road from the house. The train station is nearby, so the house is ideal for those commuting to Cork city. Contact us for rates which will vary depending on the tenancy period. Sleeps 8.